Why would anyone want to be a servant? 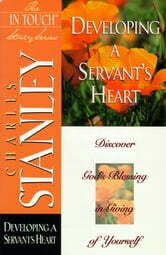 The word itself brings images to mind of a lowly, abused slave-a "lower rower," as author Charles Stanley puts it. Yet the fact is that the King of the Universe lowered Himself and became a Servant of servants-and He commands His followers to do the same. "I am the most like Jesus," Charles Stanley writes, "when I serve others." That is the central premise of this Bible study guide: Christians become fully like the Lord Jesus only when they serve others. This Bible study will equip you to serve the people around you: family, co-workers, neighbors-the people that you interact with every day. You will find very practical suggestions and principles here, all drawn directly from the Word of God. This book will train you to become more like Christ. When You Pray, What Should You Say?